– to me he is the man who saved my fathers life. Chapter Sixteen: The Liveliest Dice Since Daba Days ………..
Clarke led six Kittybombers in a bombing attack on a German landing ground in Tripolitania. When the bombing was done they straffed ack-ack pits. Flak hit Sgt. “Tubby” Palethorpe's aircraft and he was forced to land a bare four miles from the enemy drome. The Germans were close by and started to shell “Tubby”. Unhesitatingly “Nobby” Clarke went down to the rescue. He landed alongside the crippled machine. Palethorpe weighed 13 stone and Clarke himself was about six feet tall, but somehow he packed Palethorpe into the cramped Kittyhawk cockpit with him. He gave her the gun and tried to take off, handicapped because with the burly sergeant on his lap he could not handle the stick and he could only use the rudder bar with the greatest of difficulty. The Kitty began to swing left and at the same time plough up the ground with its right wing tip. Clarke opened up the throttle, shut his eyes and, he declared, prayed. The aircraft bounded across rocks and mounds and shrubs. She staggered into the air minus her starboard wheel and wing tip. She “mushed” back onto the “deck” again – “for luck” Clarke says – and holding his breath he held her up off the ensuing bounce. The other four Kittyhawks that were circling above them ready to fight off any straffing Messerschmitts heaved sighs of relief and escorted the hero home. Pieces of fabric kept flying off the damaged wing all the way home, but they made it. 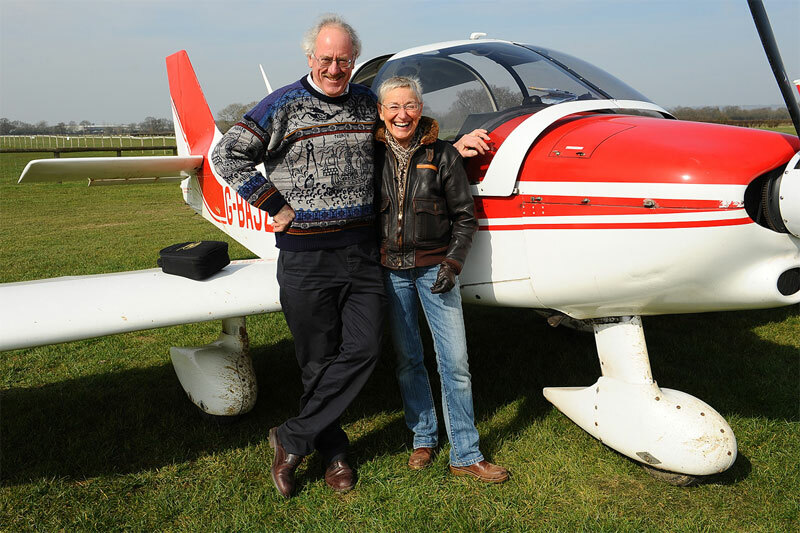 “Nobby” pulled off a perfect belly-landing on his own aerodrome despite his passenger’s presence. The Squadron, as was recorded in the Mess Log, gave “Nobby” a “pat on the back for guts and ability” Only two men in the Squadron that Christmas Eve felt slight reservations about rejoicing – Gordon Troke, whose beloved plane Palethorpe had been flying, and the Intelligence Officer, who had received a severe shock when he saw five aircraft land and six pilots emerge from them. This is a paragraph from a book called Close to the Sun by Carel Birkby relating the story of 250 Sudan Squadron RAF – Tubby Palethorpe – the chap that was shot down was my father, at that time a 19 year old rookie who had just learned to fly and was sent to the desert to kill or be killed. The entry in his log book after he landed was so matter of fact you would hardly give it a second look. My father went on to fly many types including Spitfire, Hurricane and Mustangs he was eventually a test pilot on Lightnings. He sadly died when he was only 42 years old. 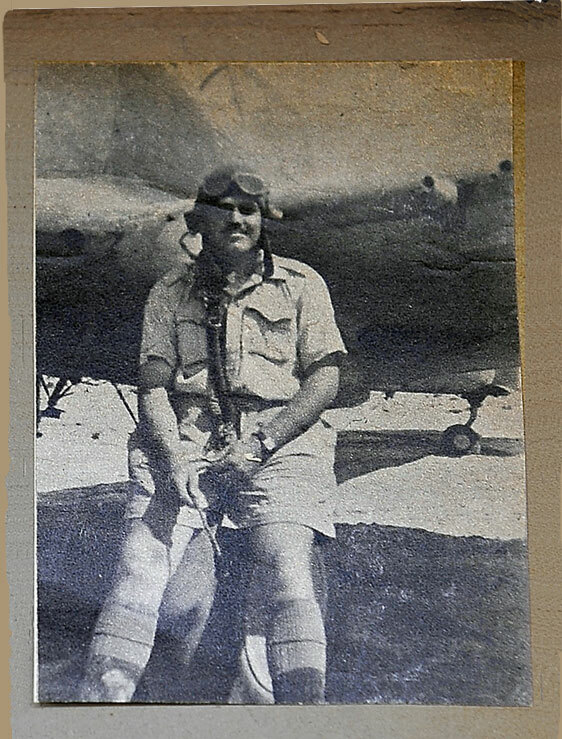 Nobby Clarke was awarded the DFC for his heroic rescue of my father – thank you “Nobby” – Blue Skys. The story doesn’t end there though, when my father died all his records and photographs were destroyed and I have spent many years trying to find out about his service history. The Ocean Rowing Society provided me with the link I was looking for and I had now located Squadron Leader Clarke. 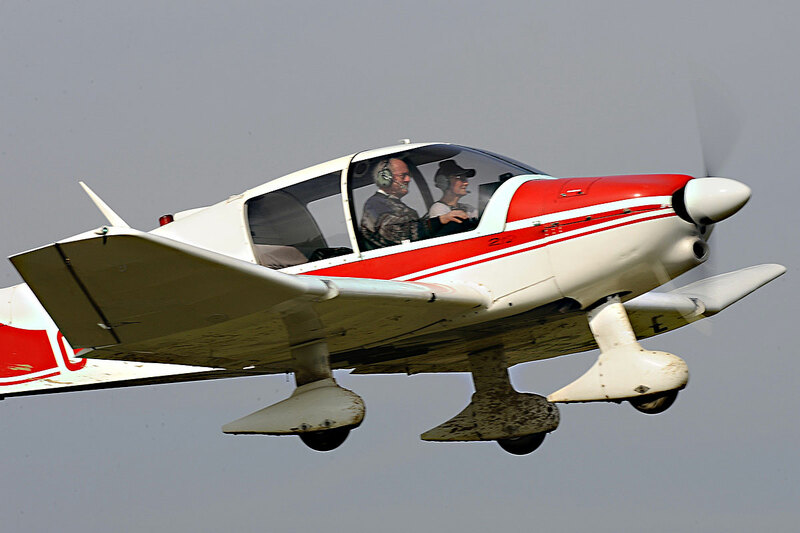 My joy was short lived when I discovered he had passed away [ Autumn 2007] but as luck would have it, I then managed to contact his son Kester and it was my very great pleasure to take him flying as my way of saying thank you for my existence. 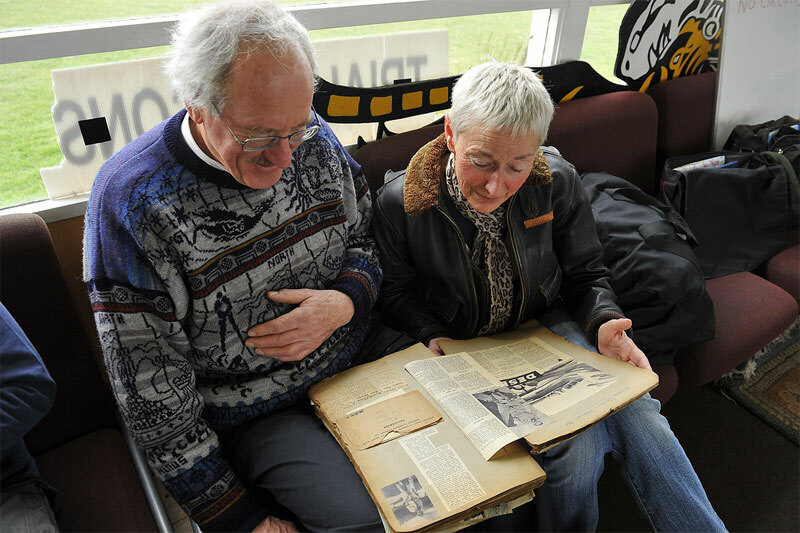 Kester was able to provide me with so much information about this story as “Nobby” had kept a scrap book and there was even a telegram from my grandfather thanking F/L Clarke for saving his sons life.